As any other seasoned pentester, I love using the Metasploit Framework during engagements. Using the database integration helps greatly in keeping all of my reconnaissance scans neatly formatted and easily queried. The “-R” switch was a welcome addition for configuring “RHOSTS” variables within modules (hosts -R, services -p 80 -R, etc…). It utilizes the host and service information within your database to configure modules to target specific hosts instead of sweeping entire ranges. The only piece missing in this utility is that some modules require “RPORT” to be configured as well. I’ll use the “auxiliary/scanner/mssql/mssql_login” module for example. If you used “auxiliary/scanner/mssql/mssql_ping” to scan for SQL servers, it’s very likely that not all of the hosts discovered are running on the old default port 1433, so each non-standard port configuration would have to be tested individually. Previously, to work around this limitation, I would export the results from “mssql_ping” to a text file and use a python script to brute force weak “sa” credentials. Now, I’ve finally figured out how to create a simple resource script to automate the configuration of “RHOSTS” and “RPORT” that i’d like to share. First, if you’re not familiar with the automation capabilites provided by the Metasploit team, HD wrote a good overview of six different ways to automate the Metasploit Framework. Also, the guys over at Offensive Security have a great intro into the Meterpreter scripting capabilities. Since I’m horrible at ruby scripting, I decided to take the route of a simple resource script, which does take advantage of some simple ruby scripting. if service.name == "mssql" and service.state == "open"
The script is pretty self-explanatory, but lets walk through it quickly. The upper half simply selects the “mssql_login” module and configures the static options. The lower half of the script is where we drop into the ruby interpreter and create some magic. We iterate through all hosts in the database and all respective services. If the service “name” equals “mssql” and the service is “open”, “RHOSTS” is assigned the IP of that system and “RPORT” is assigned that port. Finally, we “run” the module and any successfully brute forced credentials are displayed with their respective host IP. [*] Processing /root/scripts/msf/sql_brute.rc for ERB directives. [*] 192.168.81.203:31337 - MSSQL - Starting authentication scanner. In just a fraction of a second, Metasploit returns successful authentication credentials. This simple script is easy to port to other modules, such as the “auxiliary/scanner/http/tomcat_mgr_login”, “auxiliary/scanner/http/jboss_vulnscan”, or any other module that requires “RHOSTS” and “RPORT” configurations. I would love to see this fucntionality built into Metasploit, but for now, we have a simple workaround. A big thanks goes to the Metasploit Framework development team at Rapid7 for maintainig an incredible framework. All of these tools work and have their strengths and weaknesses. I’m going to share one more method that I recently discovered, using the Metasploit “psexec_command” module, created by Royce Davis (@r3dy__), from Accuvant LABS. First, we need to create an AV-safe executable to deploy to our target. If you haven’t checked it out yet, Veil-Evasion is one the easiest ways to create AV-safe executables. After we have an executable, we simply create an SMB share for our targets to access. 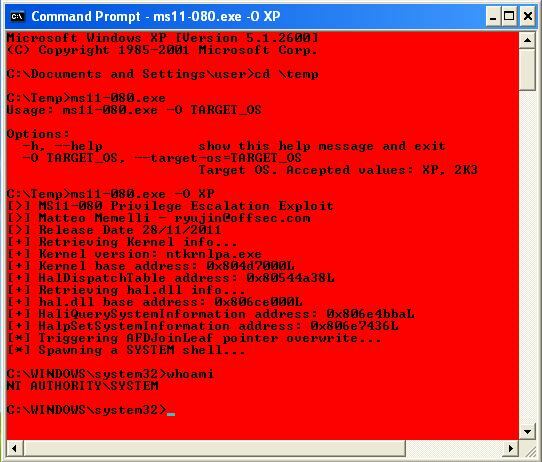 msf auxiliary(psexec_command) > set SMBPass OMGDontPwnMe! [-] 192.168.81.202:445 - Unable to cleanup. Maybe you'll need to manually remove true, false from the target. It does leave a randomly named txt file in the “Windows\temp” directory that you need to cleanup manually, but that’s it! You can also point RHOSTS to a text file of multiple remote hosts to target. Before I begin, please do not upload any payloads referenced in this tutorial to sites like VirusTotal. Antivirus companies use these samples to create new signatures for their products. OK, on to it. First of all, Veil is a nice little payload generator that will generate your windows payload all within Kali. It was created by Chris Truncer using some of the antivirus bypass techniques shared by Dave Kennedy and Debasish Mandal. Chris already has a nice tutorial on how to get setup and running. I’ve been using Option 7 to generate payloads, which seems to bypass Microsoft Security Essentials just fine. Finally, you can use CoreLab’s python version of psexec to execute your payload on a remote machine. To install, simply download the latest version of Impacket and run setup.py. Let’s walk through a quick example of using both of these tools. [*] Processing /root/scripts/msf/multi_handler/reverse_tcp.rc for ERB directives. You are currently browsing the archives for the Remote Exploitation category.